If this card is sent to the GY as Synchro Material: You can Special Summon 1 “Rose Dragon” monster from your hand or Deck, except “Red Rose Dragon”, then, if it was sent for the Synchro Summon of “Black Rose Dragon” or a Plant Synchro Monster, you can also add 1 “Frozen Rose” or 1 “Blooming of the Darkest Rose” from your Deck to your hand. You can only use this effect of “Red Rose Dragon” once per turn. Happy Monday! Red Rose Dragon starts the week with an interesting once per turn double effect. But before that, it’s a Level 3 Dark Dragon-type Tuner Monster with 1000 Atk and 1800 Def. Dark Dragon is excellent, and I can appreciate the Def but that’s about it. I am looking forward to the day that a monster will have 2 types so that this can be Plant as well maybe in the hand field and grave at least. For the effect, you should Synchro Summon a Black Rose Dragon or any Plant Synchro Monster to get a free different Rose Dragon monster from your hand or deck to the field and then a free search of Frozen Rose or Blooming of the Darkest Rose from your deck to your hand. 1 card becoming three (the synchro, Special Summon, the search) is about as good as a card can get. While the search has limited future potential, the Rose Dragons can expand to many colors. Red Rose Dragon will be able to get them all and help Synchro climb with minimal resources even in Link Format. Sounds good to me. We continue into Legendary Duelists 4 with Plant Week, starting off with the new Tuner Monster, Red Rose Dragon. Red Rose Dragon is a Level 3 DARK Dragon Tuner with 1000 ATK and 1800 DEF. 1000 ATK is low, but that 1800 DEF is pretty nice, also being a Level 3 Tuner is great, and DARK and Dragon make for a great attribute/type combination. Being Dragon in a wave of Plant support is weird, but some of the cards do work with Dragons, so it is fine. 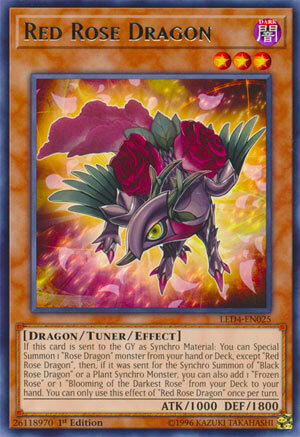 If this card is sent to the GY as a Synchro Material, you can Special Summon a Rose Dragon monster from your hand or deck excluding another Red Rose Dragon and if this card was used to Synchro Summon Black Rose Dragon or any Plant Synchro Monster, you can search for one Frozen Rose or Blooming of the Darkest Rose from your deck to your hand and all of this is a hard once per turn. First off, with the Rose Dragon summon, any floating from the deck is good and Red Rose Dragon should be used as a Synchro Material often enough since it is a Tuner. So far we have Blue Rose Dragon and White Rose Dragon will be on the way very soon in the Savage Strike Special Edition, so this card isn’t really at full power yet. The search is nice, as Frozen Rose is a pretty good card and Blooming of the Darkest Rose can be decent, but overall searching for anything is a nice touch, even though you got to Synchro Summon something specific, but in a Plant deck at least Black Rose Dragon has a use beyond nuking the board and there are some solid Plant Synchros. Red Rose Dragon is a pretty nice card to help Plant decks make big plays, and maybe will help mix with Guardragons in some Dragon decks even. Art: 4.25/5 The roses are pretty, though I find it odd that this is Red Rose Dragon when Black Rose Dragon herself is red more than she is black while this looks black more than it is red. As Legendary Duelist of the Ladies continues, after a Mai week, and an Alexis week, we come to an Akiza week, opening with Red Rose Dragon. So, Dark, Level 3, (which is good synergy with Black Rose Dragon, go figure) 1000 attack and a nice 1800 defense, all on top of being a Tuner. When sent to the Graveyard as Synchro Material, you get to Special Summon a Rose Dragon from your Hand or Deck, other than Red Rose. That leaves you with Blue Rose Dragon or White Rose Dragon (the latter which is still Japanese only I believe) but I digress. Additionally, if used to Synchro Summon Black Rose Dragon (which is quite probable) but also included any Plant-type Synchro, you can add a Frozen Rose or Blooming of the Darkest Rose from your Deck to your Hand after said Synchro Summon. Frozen Rose is a Quickplay Magic that lets you Draw 2 cards (and then discard 1) at your End Phase, if you sent a face-up Plant from your Field to the Graveyard, or (if it was any non-Plant type Monster) lets you add any Level 4 or lower Plant Monster from your Deck to your Hand. (Only one can be activated a turn). So you get a theme specific Draw 2 effect (that ends up being a -1 after the discard and playing Frozen Rose) or a -1 that nets you a Level 4 Plant or below of your choice from your Deck. Blooming of the Darkest Rose is a Trap that gives Rose Tokens (to either Field) but is dependent on the use of Field Magic cards (on the Field Zones and/or in Graveyards) and can further more be removed from your Graveyard to target and remove from play a Black Rose Dragon or Plant you control to place BotDR on the bottom of your Deck, and return the removed Monster during your next turn. Red Rose Dragon is fun, and able defender, great value and synergy with Tuner, as well as the Rose family, and has the ability to search out a decent enough Magic card and a relatively unimportant Trap. But this is still a great card for a Black Rose/Plant player (hopefully more the aforementioned) as it’s where she’s best for the player, so use her wisely.